Living with Superficial Siderosis will be heading to Capitol Hill in Washington DC this weekend to join with fellow rare disease advocates, patients, and caregivers from across the country. Representatives from all fifty states will gather to share experiences, tell their stories and discuss with our legislatures how important we as a community count on their much-needed support for an increase in the annual discretionary funding for the National Institutes of Health (NIH) and support an increase in funding for the Food and Drug Administration (FDA) in the Fiscal Year 2020. Monday, February 25th, we will spend the day learning how to effectively meet with legislatures, practice strategies with our advocate group members, and prepare to make the most of our day on Capitol Hill. Tuesday we head to the hill to spend the day meeting with multiple Members of Congress and their staff with our plan to lobby for legislation important to our Superficial Siderosis community. 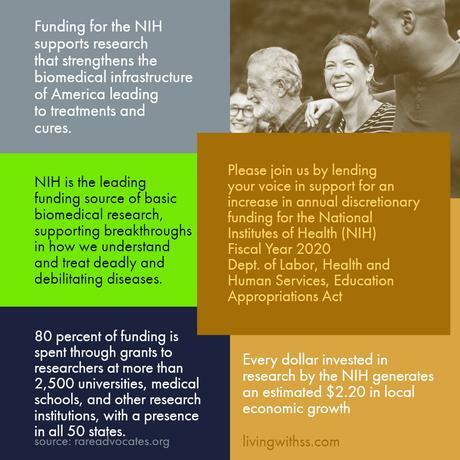 Number one on our agenda is support for increased funding for research grants. Ask your Members of Congress to join The Rare Disease Caucus. RDLA (Rare Disease Legislative Advocates) will find your legislators for you. Follow this link, enter your address and add a personal note about why their support of The Rare Disease Caucus is vital to you. If your legislator is already a member of the caucus, then can send a thank you letter to your legislator instead. The Congressional Rare Disease Caucus is a bipartisan platform where members of the House and Senate discuss constituent concerns, join forces on ideas, open doors for a dialog between the medical and patient community and solicit support for favorable legislation that improves the lives of people with rare diseases. On Wednesday, February 27th, we will be attending a Rare Disease Congressional Caucus briefing from 2:00 pm – 3:00 pm EST. Titled “Rare Disease 101”, this briefing will provide insights on rare diseases and the impact on patients and their families. Everyone can watch this briefing from the comfort of their home on Wednesday, February 27th, from 2:00 pm – 3:00 pm (est ) by registering for the free livestream here. We will spend Rare Disease Day at the National Institutes of Health (NIH) on Thursday, February 28th. Speakers include leaders from NIH, the Food and Drug Administration (FDA), and representatives from other Rare Disease patient advocacy groups. We have one additional stop planned Thursday afternoon as representatives of The Silent Bleed and the excellent work they do for all of our Superficial Siderosis community before we head home to Texas. We’ll leave the telling of the details of this portion of our trip to The Silent Bleed. We are asking every member of the Superficial Siderosis community, patients, caregivers, medical, and advocates who are on Facebook to use the Rare Disease Day profile frame for one week starting Sunday, February 24th until March 1st. It doesn’t matter where you live. There are Rare Disease Day events planned all over the world. You can add the frame from this link. Our stories may be unique but we are all the same.